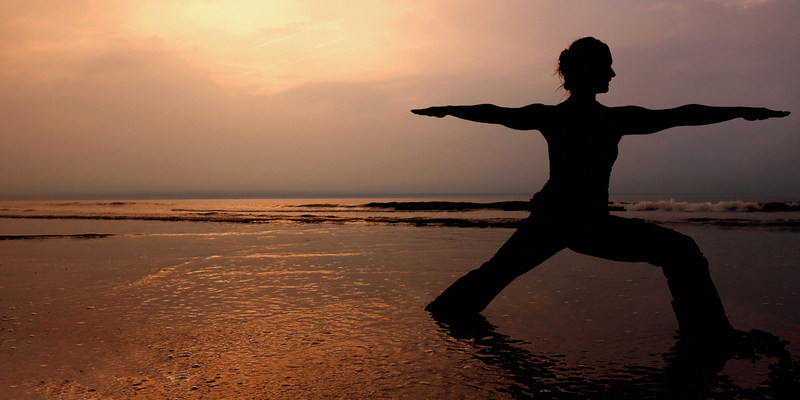 Of all the poses in the practice of yoga, Warrior Two makes me feel the biggest! Warrior Two builds incredible leg and core strength and teaches sustained balance. When you add Warrior II to a flowing sequence, move deep into the pose (the quadriceps on an even plane with the floor) and hold the pose for five breaths. If this is repeated several times throughout your practice, believe me, you’ll feel the burn soon enough. As a dancer, Warrior Two teaches us an important technique, moving in multiple directions at once. To get the most benefit from this pose it is important to consciously activate all of the muscles in the body. You can’t simply be supported by your legs and feet, or simply lift your arms into position. From the center (your solar plexus) feel the energy of your muscles radiate through your legs and then both of your feet into the ground. And through your arms all the way to your fingertips. Lift through the base of the neck straight through to the crown of your head and beyond. Focus on feeling energy move you in all five directions at once. Focus your eyesight past your front fingertips and bring to mind the best vision of yourself in the future. Now hold that vision and recognize the strength you draw on every day to get yourself to tomorrow. Breathe. Do not allow your body to settle or sag into this pose. Keep everything active until it is time to move to the next pose. Practicing Warrior II in this way, you will feel bigger and stronger and capable of facing whatever comes your way. Til next Wednesday . . .